Description: Cloudy swimming pool water is an unwanted nuisance that can be difficult to remove. 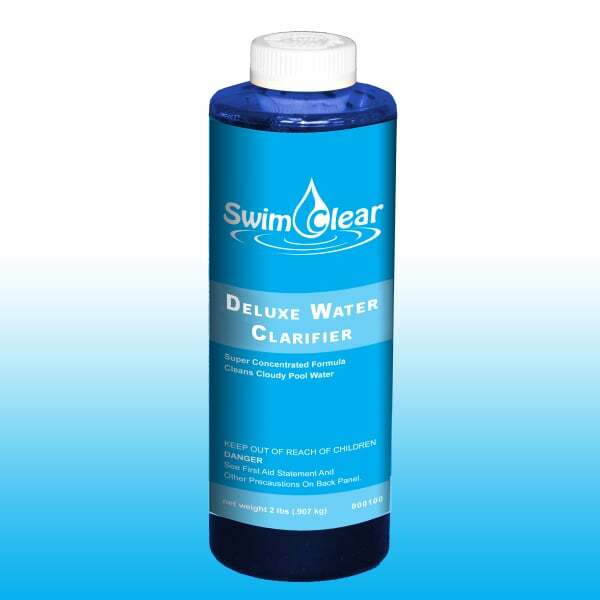 Deluxe Water Clarifier by Swim Clear contains a powerful formula that attaches to smaller organic debris and dirt particles, allowing these unwanted agents to be grabbed by the regular swimming pool filter. Function: Small pieces of organic matter, dirt and debris can be too small for the typical pool filter. This special clarifier attaches to these particles and compounds so the pool filter and vacuum can easily remove the cloudiness, granting you crystal clear water! Maintenance dosage is 4 oz. per 10,000 gallons of water once a month. For cloudy water add 16 oz. per 10,000 gallons of water. Run filter and pour directly through the skimmer or around the pool perimeter. Wait three (3) hours and vacuum the left-over debris on the bottom of the swimming pool that fails to reach the filter.